How can educators ensure that students internalize the writing process? High quality writing instruction provides students with not only compositional skills, but also teaches writers a process that they can use to complete any writing project from the blank page to a published work. Internalizing such a process empowers students to complete any type of assigned writing tasks as well as how to begin their own writing pieces – allowing students to independently write about whatever they might choose and to transform into authors, journalists, poets, and bloggers outside of the classroom. 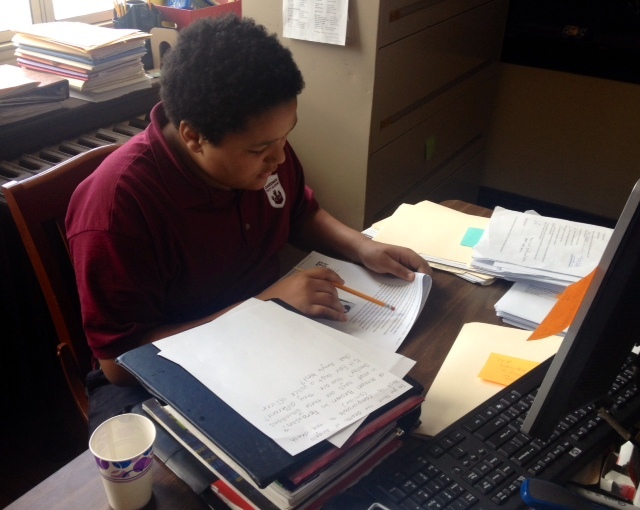 A sixth grade student at the Gardner Pilot Academy reads and takes notes during the planning stage for an essay contrasting a police shooting in Boston to the murder of Michael Brown in Ferguson. I have adopted the mnemonic P.O.W.E.R., and I find it extremely useful as a memory aide for the writing process. P.O.W.E.R. stands for Plan, Organize, Write, Edit and Revise, and Rewrite. This mnemonic is introduced to the students during the first weeks of school, and it used for all of our process writing work throughout the year. I usually select a project centered around the theme of identity for our first process writing piece of the year. As I model writing about my own identity for my students, it allows them to get to know the human side of their teacher, and their published pieces serve as a platform for sharing their own identities with their classmates, myself, and the wider school community. 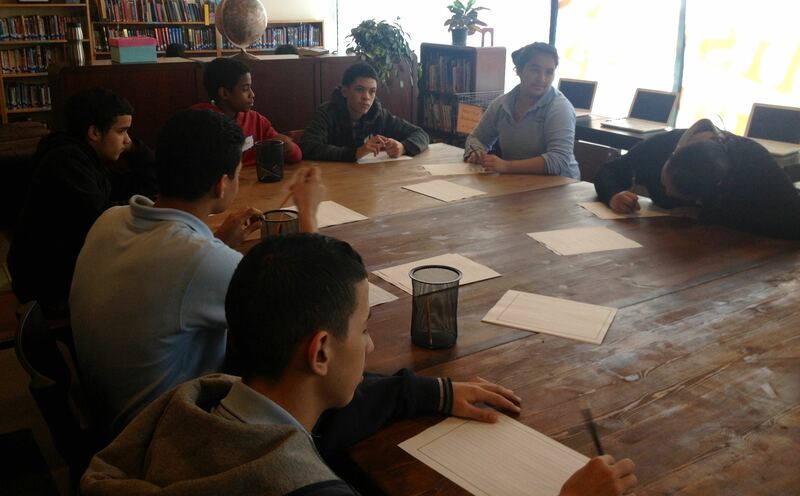 Seventh and eighth grade students from the Lilla G. Frederick Middle School plan for script writing at local writing center 826 Boston. As I guide the class through these initial writing process pieces, I explicitly teach lessons around each step of the writing process. I begin by assigning a quick write focused on the following question: How do people who can write have an advantage over people who cannot write? Student thinking and responses to this question inform a class discussion focused around the essential question “How can writing give you power?”. This initial discussion tends to focus on practical examples from students’ personal and family experiences, such as being able to write a note to a friend, a job application, a check, or an e-mail to a teacher. However, as the year progresses, this question is revisited in the context of reading, discussing, and writing about current and historical news articles, ancient and historical texts, and class novels. As we progress through each stage of the writing process, I offer explicit lessons that unpack each stage from Planning to Rewriting. Two years ago, the assigned identity piece was writing a “This I Believe” essay. During the planning phase, students listened to, read, and took notes on “This I Believe” audio and writing examples online. Then, the class and I discussed the characteristics of “This I Believe” pieces. I am writing in the following genre: ____________________ ____. I am writing this (genre name) so I can ______________________. I am writing for an audience consisting of ____________________ . I am writing in the following genre: “This I Believe” essay. I am writing this “This I Believe” essay so I can express how a life experience shaped my beliefs. I am writing to an audience consisting of my classroom and school community. Knowing that students have participated in the planning process ensures that students begin their work with the end product in mind.The sentence stems for planning are posted on a chart paper in a classroom, and we refer to them throughout the year as students move through writing projects across a variety of genres. This practice and repetition allows for students to internalize the writing process, committing the steps to memory, so more attention can be given to the finer points of their words as opposed to the steps they take to get them on paper. This article is the first in a three part series on the topic of “Internalizing the Writing Process”. Next > But How Long Can YOU Write For?